i am the first guest blogger on iamtonyang.com. i hope the other kids are rilly, rilly jealous. this morning started badly. i woke up at 6:30 with a terrible headache. after some ibuprofen i managed to get another few hours of sleep before starting the day. the morning's spam did not contain the usual insults to my manhood, instead suggesting i am fat and have an unhealthy interest in britney spears. from washington, maureen complained about the president's illiteracy (this is what happens when the post is your local paper: you are exposed to all kinds of bad stuff). from new york, my brother made fun of me and the word "nosegay" simultaneously. from the same city, karen and i continued our dialogue about such subjects as the wb's "seventh heaven," j.lo, and the joys of latin. doug wrote that he has returned from new york, where he went out in the east village one night and replied "ok!" every time the bartender said, "here, drink this, i made it by mistake." apparently the next morning was a little rough. by now coffee and ibuprofen had gotten my head under control so i started the day's task: finish-painting the entryway in the apartment. two coats of primer (likely source of headache) had removed most traces of the previous color, underfunded public health clinic green. jack and i had chosen an orange called "indian paintbrush," despite the clear political incorrectness of the name. we feared anything darker would become icky brown in a small room that gets very little natural light. i imed with tony, who agreed to photograph. he was going to come over almost immediately but i put him off since taping around the ceiling and doors took almost an hour. tony arrived to watch me start in the least visible corner. i decided to put on pants, which i had not done for the priming, because this is a family website. or because the world does not need to pander to anyone else with unhealthy interests in anything. tony took a whole bunch of action shots and then went off to his house which was subsequently inundated with guests expected and otherwise. meanwhile i slowly spread the orange latex, with nirvana, rufus wainwright, and my friend adam's recording of cello sonatas to inspire me. i ran out of indian paintbrush with only half of one small wall to go and went out to get more. i had gotten everything covered when dennis came home. we started to remove the tape and discovered a lot of orange had seeped onto the (glossy white) moldings and door frames. worse, the ceiling tape was picking up the orange off the top of the wall, so i had to cut it out with an exacto knife. i set to work on the seepage with a plastic putty knife dennis provided; after i got the worst off i patched with, uh, correction fluid, which worked rather well. susan then arrived and obviously hated the orange. she later conceded that it is better than what was there before. worried about jack's reaction i put a note on the door that said "don't worry: it dries darker." tony came back for more pictures just as jack arrived. fortunately -- since he's got to live with it full-time -- jack loves the color. tony took more pictures, including jack in a few. he than attached his camera to the back of the tv and showed us all the pictures he had take. technology is amazing. we had just settled down to dinner when i decided that my first blog entry would not be complete without a picture of dinner. 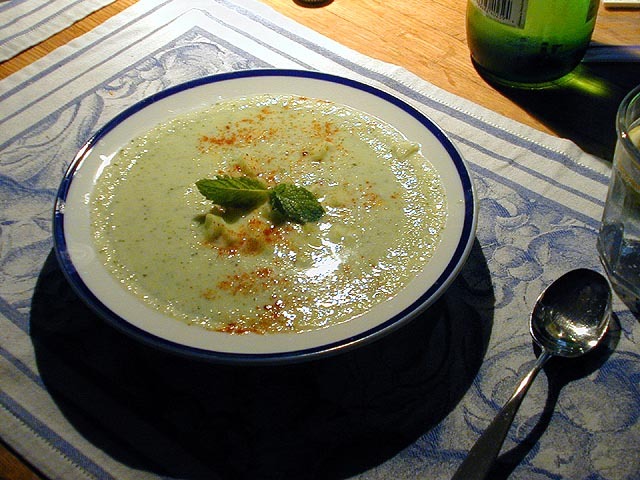 i had made cucumber soup with garlic and mint yesterday so we had it tonight. i primped it for the camera. tony, who is a very patient man, came back up the street for the third time today and photographed our meal; i then photographed him gaping at it. he loves a pretty thing, tony does. after dinner i worked on the ceiling some more with the exacto knife and a few more dabs of orange paint and white-out. it's about to where you wouldn't notice the imperfections unless you go looking, so i may not fool with it any more, although the white-out doesn't work as well on the ceiling. the mexican paper art in red and black (gift from susan) is going to look very striking when we rehang it. then jack and i continued the tedious process of checking the page proofs of my book, called "robert of arbrissel: a medieval religious life." doesn't that sound riveting? publication date december! makes a great stocking stuffer! order your copies today! anyway, we are discovering a few small errors and blunders so it's work going through the thing word for word. since yesterday, when we found i had used the adverb "vigorously" twice in only a few pages, jack manages to find a double-entendre in about every fourth sentence. this probably slows down the work, but certainly makes it more enjoyable. you will note i have appropriated tony's blog, his journal style, and his entryway color. tony, you might want to keep careful watch over that "frankenhooker" dvd. i woke up at 9am to help my neighbor doug with some demolition cleanup work in his condo. basically a pile of wooden garbage planks of various sizes needed to be bundled together with duct tape. the job was made more challenging with the introduction of nails sticking out from many of the planks. after i was done (and $30 richer), i came home and took a shower. 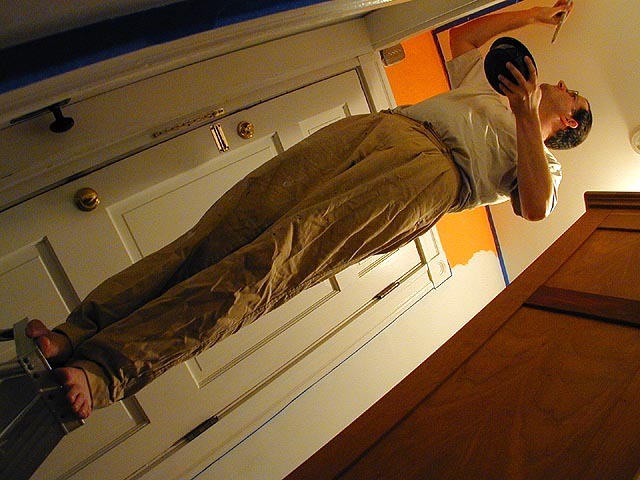 after breakfast, i went over to bruce's place where he was painting his foyer orange, just to have a look. i went to joie de vivre to get maureen a card, i heard from manny it was her birthday this weekend, and since manny was going back to new jersey tomorrow, he could hand deliver the card to his sister. i picked a mr.winkle card where he's posing with some garden gnomes. andrew came home before manny and daisy arrived. i gave them their wedding present, then they showed me their photos from their honeymoon in hawaii as well as giving me some souvenirs (macadamian nuts and some bird of paradise seeds). daisy's sister anne and her boyfriend showed up later, here to see the condo as well as my photos from the rehearsal dinner and wedding (copies of which i burned onto a cd for manny/daisy). alex wong showed up unexpectedly, with everyone crowded in the living room watching the photo slideshow on my ibook. people didn't start leaving until 5pm. when i gave manny the birthday card to give to his sister, it turns out it was the other sister, mimi (my dance partner at the wedding), who was having a birthday. embarassed, but too late to change what i wrote on the card, i told manny to give the card to maureen anyway (who's birthday is in october), and i wrote on the envelope, "happy birthday mimi". lame, i know. i had planned on going running, but the day was already over. my parents dropped by with some food, while i went next door to revisit bruce and see his orange foyer. i went back a second time after he came to my door to ask if i could take some food photos for him. we ran to his house in order to avoid having to talk with our neighbors. i came back home to dinner, meat buns and some green pea soup, which i shared with andrew.